We did it! 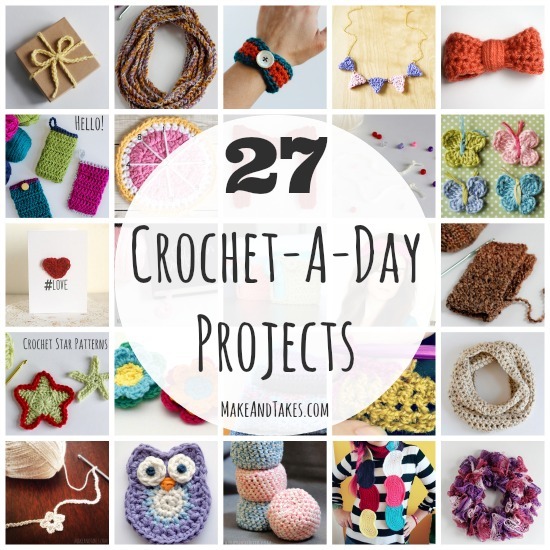 We crocheted our way through 27 days straight. If you followed along, pat yourself of the back, three cheers for you!! I had so much fun showcasing all sorts of crochet patterns and tutorials all month. It was Crochet-A-Day success! 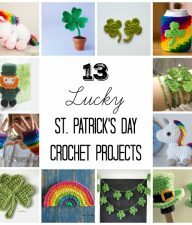 All of these patterns and tutorials are projects you can crochet in just a day. I hope this series has inspired you. 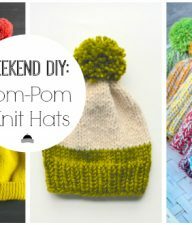 You can crochet some really fabulous projects that are simple, easy, and fun! 1. Chain Stitch Wrapping Ribbon: With a simple chain stitch, you’ll have yourself some handmade wrapping ribbon to tie around all your gifts. This works with any color or size yarn. 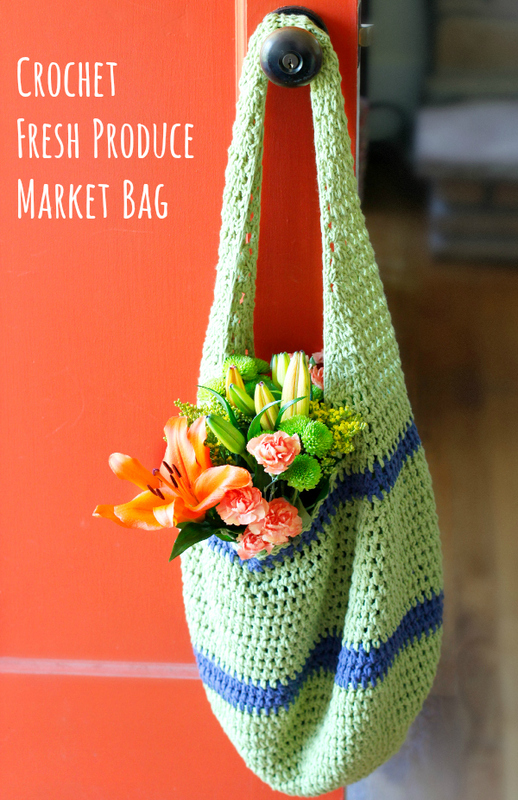 Use up all those yarn scraps! 2. Chain Stitch Necklace: Keep the chain stitch going for a few feet long and you can wrap it for a darling necklace to wear. You can make it long or short and chunky. Either way, it’s darling! 3. Bracelet with a Button: Crochet this darling bangle pattern and it’s the best gift for friends. it comes with a button and you can mix and match different colors for flare. 4. Bunting Necklace: These darling little triangles form into a fun bunting necklace. Add a chain and it’s ready to wear. 5. Bow Tutorial: This bow tutorial is super quick and easy. You can make little bow ties for the boys and fun hair bows for the girls. Great for gifts. 6. Phone Cozy: With all the time we spend on our phones, we need to keep them all cozy. Crochet this phone cozy to help your phone not get too shuffled around in your bag! 7. Grapefruit Coasters: So cute, you’ll want to eat one! Or just place your grapefruit juice glass on top of this fun coaster. 8. Alphabet Letters: Make a whole set of letters crochet patterns with this fun tutorial for all 26 alphabet letters. You can make them large and display them in your child’s room. 9. Finger Crochet Snake: Try you hand at finger crochet. It’s easy and no hook needed. Make this fun little yarn snake to slither around. 10. Butterflies: These darling butterflies are a fun toy to make for kids. Even a perfect applique for a bag or headband. This pattern comes in 3 sizes. 11. 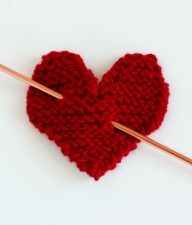 Heart Card: Crochet this simple heart and glue it onto a love card. It’s a great handmade greeting card to make for friends and loved ones. 12. Bookmark: This is a super simple and fun bookmark to crochet, with circles and a chain stitch middle. It will keep your page marked for your next reading session. 13. 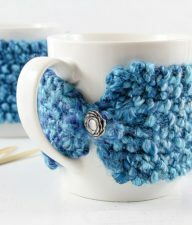 Coffee Cozy: I’ve found 3 fabulous patterns for a coffee cozy, all a little different to fit your favorite drink’s needs. 14. Scalloped Headband: How about a fun and fancy scalloped headband to wear? It’s the perfect accessory to whip up in a day! 15. Hand Warmers: Keep your hand warm during the cold winter months with these fuzzy and functional hand warmers. Crochet them in different colors or even add a fun applique to the back. 16. Star Crochet Patterns: Here are 2 different patterns for crochet stars. Each are very different, but both are darling! I suggest you try your hand at both. 17. 4 Flower Patterns: We’ve got 4 super sweet crochet flower patterns to feature. 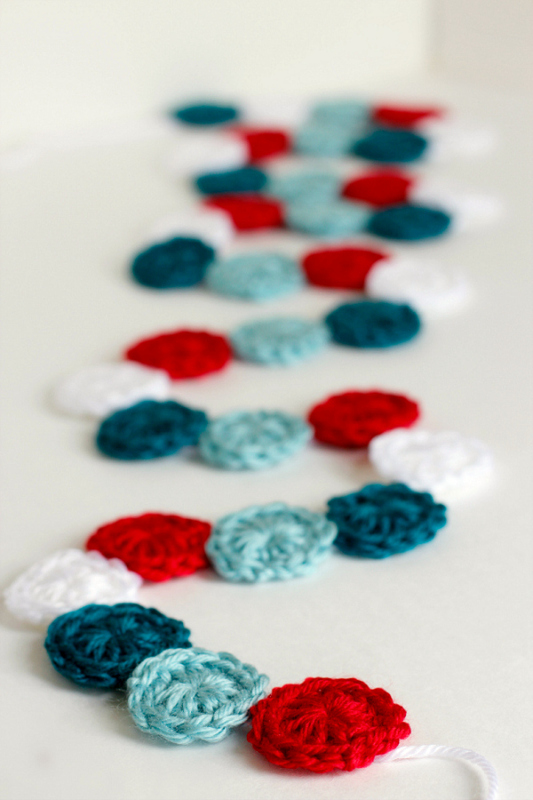 You’ll want to try your hand at all of them, making a lovely crochet floral bouquet! 18. Baby Blanket: Make a sweet little baby blanket with this double crochet pattern. It’s super sweet and will make any little one love it! 19. Crochet Tips and Tricks: I’m always looking for better ways to crochet and finding little tips and tricks that can help improve my skills. Here are 4 fabulous crochet tips and tricks. 20. Choosing Yarn: Need help choosing the perfect yarn? Or even the right stitch for your project? See some tips and advice on how to make the best choice for your next crochet project. 21. Chunky Cowl: Crocheted scarves are my favorite projects to make, especially for the winter season. This is an infinity scarf crocheted in the round, making it fun and easy to wear anytime, anywhere! 22. Heart and Flower Necklace Crochet Patterns: These super cute heart necklaces are sweet and perfect for your little ones to wear. Make a heart or a flower to fit your little ones fancy! 23. Animal Appliques: These darling little crochet animals are ready to crochet in just a day. They are little and simple, and super sweet! 24. Hacky Sacks: Here is a fabulous amigurumi type-pattern for an Easy Crochet Hacky Sack. You’ll want to make one and try your “foot” at the game of hacky sack! 25. Boot Cuffs: Try making your own boot cuffs to add to any pair of boots, helping give them a little flare. You’ll also learn a crochet ribbing technique, as well as a simple and lovely stitch called the linen stitch. 26. Jelly Bean Scarf: You could easily crochet 1 or 2, maybe even 5 of these jelly beans in just a day. In less than a week, you’ll have all your jelly beans made to assemble and join them into a darling to die for scarf! 27. Ruffles Scarf: Try a different kind of yarn, ruffles, to make this super cute crochet ruffles scarf. It’s a fun and fluffy scarf to wear anywhere. Visit our Crochet Patterns and Tutorials page to see all the fun we’ve had with crochet! 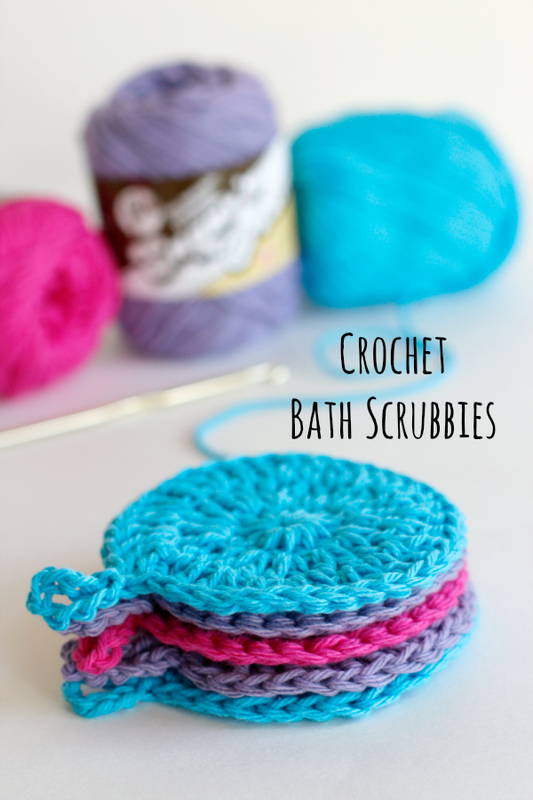 Just recently taught myself some simple crochet – can’t wait to try some of these!!! Thank you!